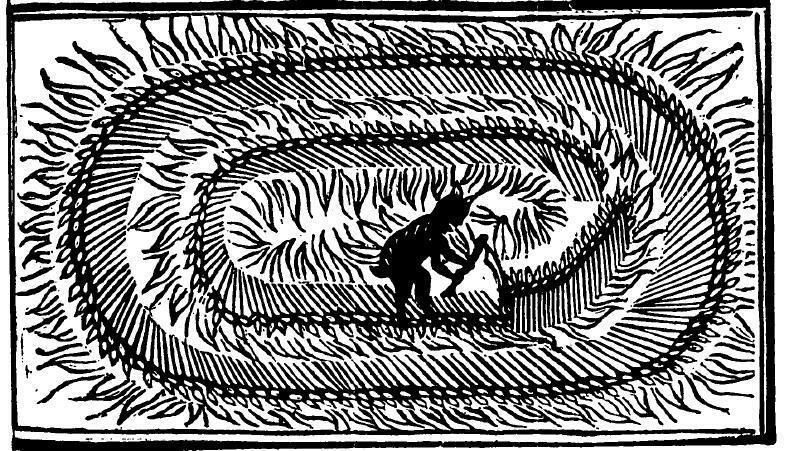 The Mowing-Devil is a quarto pamphlet printed in 1678.1 It tells the story of a farmer whose field of oats was destroyed by the devil, after the farmer rejected the price asked by a mower and said that the devil could mow it instead. The pamphlet is often prayed in aid by crop circle enthusiasts as an example of crop circles being a pre-modern phenomenon. The Wikipedia article on the pamphlet puts this forward as a possibility, as do a number of crop circle websites. One, Swirled News, has carried out lengthy research into the provenance of the pamphlet, examining a copy in the British Library and discovering that there are a number of subtly different modern recreations of the woodcut illustration. At a quick glance it certainly does bear a resemblance to a crop circle – it looks like there are concentric rings of crops being pressed down by the devil. totally devour’d by those ravenous Flames which were observ’d to be so long resident on his Acre and a half of Ground. Below is a close-up of the woodcut on the pamphlet’s title page. A close look shows what actually appears to be flames either side of the oats. Although the devil is cutting the oats down with a scythe, I’m fairly confident this is a representation of the diabolical flames consuming the field, rather than the devil cutting patterns into it. The pamphlet does then claim that the next morning, the oats were perfectly mown, and it’s possible that this may have been the way they were destroyed – but I suspect fire is the more likely explanation. A close reading of the text reveals at least two rather different contexts that would have made much more sense to contemporary readers than speculation about crop circles. One is religious. The pamphlet starts with a proof of God: if devils exist, then there must be a Hell in which they live. If there is a Hell, there must be a Heaven, and hence there must be a God. The way in which the pamphlet deploys imagery of the devil can tell us something about its intended readership. Its imagery owes much to late medieval conceptions of the devil, in which he (or occasionally she) could appear as a physical being. This often presented the devil in a humorous or socially-inverted context. He appeared in medieval “merry tales” and mystery plays, often in a sexual or scatological context. Such images would have been recognisable by those at all levels of society during the fifteenth and sixteenth centuries.2 By the mid-seventeenth century, however, this late medieval conception of the devil was being challenged. Godly puritanism emphasised the power of the devil, putting the struggle with him at the centre of spiritual life. However, this challenge was not entirely successful – medieval conceptions of the devil continued to live on amongst much of the population of England.3 So this pamphlet would have had more appeal to those in rural communities who remained attached to the rhythms of the old church, who had turned against puritan tendencies. endeavour’d to sell the Sweat of his Brows and Marrow of his Bones as at dear a Rate as reasonably he might. But the farmer won’t give him a fair price for his labour. After some sharp words, the “honest Mower” runs back and offers to do the work at a much lower price than he’d ever offered to anyone else. But the farmer is having none of it, and makes his quip that the devil will mow the field before the mower does. The farmer here – at least as far as the pamphlet’s author is concerned – stands guilty of breaking the moral economy of their rural community.4 The mower has offered a fair price within a framework of what is acceptable, and even offers to do the work at a loss. But the farmer rejects this, and by stepping outside the moral economy pays the price. It seems likely that the fire in the field was caused not by the devil, but by the mower or at least by friends or family members within his community. Again, this context would have been instantly recognisable to contemporary readers – a cautionary tale, perhaps, for middling sort landowners, and a comforting assertion of traditional values of fair play for rural wage labourers. Only a minority of this latter group might have been able to read the pamphlet, but all would have been able to see the illustration, and discuss it or have it read to them by those who could read. In short, The Mowing-Devil is probably not the representation of an early crop-circle that enthusiasts want it to be. In focusing on the woodcut, they’ve missed a much more interesting side to the text that tells us something about late seventeenth-century popular politics and religion. 1. Anonymous, The Mowing-devil, or, Strange news out of Hartford-Shire being a true relation of a farmer, who bargaining with a poor mower about the cutting down three half acres of oats, upon the mower’s asking too much, the farmer swore that the devil should mow it, rather than he… (London?, 1678), Wing / M2996. 2. Darren Oldridge, The Devil in Early Modern England (Sutton: Stroud, 2000), pp. 16-23. 3. Oldridge, The Devil in Early Modern England, pp. 58-89; Nathaniel Johnston, The Devil and Demonism in Early Modern England (Cambridge University Press: Cambridge, 2006), pp. 1-8. 4. E.P. Thompson, “The Moral Economy of the English Crowd in the 18th Century”, Past & Present, 50 (1971), pp. 76-136. There’s something I haven’t seen for a while. I did my MA on folklore and crop circles and the mowing devil was an interesting case study. Although your analysis of the narrative is pretty reasonable I think it’s also worthwhile applying Hufford’s notion of the experiential source hypothesis. Put simply, it works on the basis that people explain anomalous experiences within the pre-existing worldview of a particular culture. So for example, encounters which might once have been explained in terms of fairies are nowadays explained in terms of aliens, lights in the sky which were explained as zepplins at the dawn of the 20th century are now explained as UFOs and so on. In the vanishingly few cases of crop circles which are not demonstratably hoaxes there are, very rare, accounts of lights in the sky in vicinity and time of circle formation. It is thus possible, if unlikely, that the pamphlet attempts to explain an unusual event through applying well-known phenomena. It *may* be that the strange occurrence in the field is actually more real than the suspiciously neat cast of characters and events.